Billings Farm was established in 1871 by Frederick Billings, a native Vermonter known for his work as a lawyer, railroad builder, and pioneer in scientific farm management and reforestation. Billings set out to make his 270-acre Woodstock farm a model dairy operation for farmers in the region, founded on the principles of efficiency, sustainability, and responsible land use. Now owned and operated by The Woodstock Foundation, Inc., a non-profit educational institution founded by Laurance and Mary Rockefeller in 1968, the Billings Farm & Museum was established in 1983 to preserve the historic Billings Farm as well as the character and heritage of rural Vermont. After an interval of almost 70 years, Billings Farm is once again drawing upon their 150-year tradition of dairy excellence. 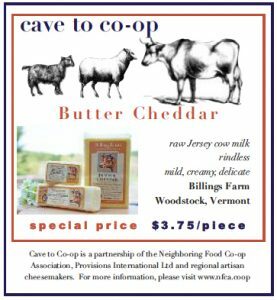 Billings Farm Cheddar is made from 100% raw milk exclusively from the Billings herd of over 40 purebred registered Jersey cows, with no additives, preservatives, or artificial coloring. Butter Cheddar, also known as Butterkäse, is mild and creamy with a slightly salty or acidic taste reminiscent of Muenster or Gouda cheeses. Known for its delicate flavor, it literally melts in your mouth. Butter Cheddar is a very child-friendly cheese that is also well suited to classics such as grilled cheese and mac n’ cheese. Try one of these recipes to see how versatile Butter Cheddar can be in the kitchen. 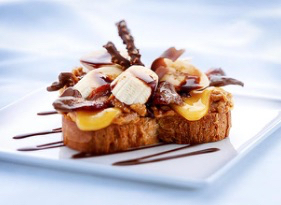 Inspired by Elvis’ love of peanut butter and banana . . . . don’t knock it till you try it! Place bacon slices on a baking sheet pan with sides and bake until lightly browned and starting to crisp, about 5-6 minutes. Meanwhile, mix brown sugar and maple syrup until smooth. Brush hot bacon slices with mixture, using a pastry brush. Return to oven for another 5-6 minutes, turning once and being careful not to burn sugar. Remove to cooling rack and let cool. Heat griddle or sauté pan over medium heat. Butter one side of bread slices. Spread other side with peanut butter. Top each slice, peanut butter-side up, with 1 Butterkäse slice and some banana slices. Place butter-side down on griddle and grill until sandwich bread bottoms are light golden brown. Cover the pan if cheese is not melting. Meanwhile, heat chocolate sauce until warm. Dip each slice of bacon into warm chocolate to cover half of strip and place over bananas. To serve, drizzle with additional chocolate sauce. Cream butter and sugar till light and fluffy. Add eggs one at a time and mix well. Gently fold in sifted flour and baking powder until just combined. Add in shredded cheddar cheese and gently mix. Pour into a loaf pan and sprinkle remaining cheese on top. Bake for 30 to 45 minutes, until tester comes out clean. Cool on rack. frying pan until lightly browned, but not crisp. Remove to a plate lined with paper towels to absorb the excess fat. Set aside. Preheat oven to 425°F (220°C). Butter a 2 ½ quart casserole dish. 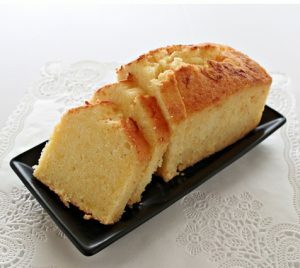 In a bowl, whisk the eggs into the flour, then whisk in the cream and milk. Add the black pepper (more or less to taste), salt, and mustard. Mix in about a third of the cheese. 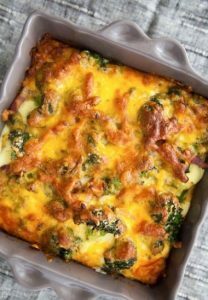 Place the parboiled broccoli florets in the casserole dish, sprinkling about a third of the cheese over the broccoli florets as you lay them down. Sprinkle the bacon pieces over the broccoli. Pour the egg, cream, milk, cheese mixture over the broccoli, moving the broccoli pieces a bit so that the mixture gets into all the nooks and crannies. Sprinkle the casserole with the remaining cheese. Bake for 25-40 minutes, until set. Once the top has browned, you may want to tent with aluminum foil to keep from burning.